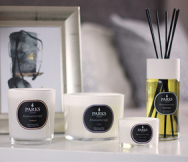 Parks’ Revitalising Diffuser Gift Set includes everything that is needed to ensure there will be an energising, revitalising atmosphere in any home, room or office for up to 12 weeks. It includes a full 250ml of our own unique blend of lemongrass, mint, orange, basil, thyme, blackcurrant and geranium scents, and an all-natural, decorative diffuser set up to ensure even, gentle distribution of these healing essential oils and botanicals. The scent of lemongrass is thought to relieve muscle pain and body aches, and clears the way for the other scents to do their magic. Aromatherapists tell us that mint helps to support both attention and mindfulness by not merely stimulating us, but also adding focus as well. It is also a clean, lovely scent on its own. . The scents of orange and blackcurrant both add sweet, fruity notes that remind one of youth and contribute that same energy to the room..
Aromatherapists say that basil has distinct stimulant properties that can reinvigorate the nerves, as well as aid concentration..
Like basil, thyme is a familiar cooking herb that is also said to reduce stress and aid relaxation. These benefits form an important counterpoint to the purely stimulating scents.. Geranium is not just a lovely floral note, it also works to aid our emotional balance. Aromatherapists tell us that this is a vital part of revitalisation, which supports us in many ways throughout our day-to-day life. . Together, this set is both deeply revitalising and stimulating in the gentlest way possible. This is a complete gift set as well and comes in a lovely presentation box. .